Phorusrhacos Skull. Phorusrhacos inflatus (Patagornis marshi). Dinosaur fossil replica. Fossil bird of Miocene Brazil and Patagonia. Phorusrhacos is an extinct, giant flightless predatory bird that lived in Miocene Patagonia. P. longissimus' closest living relatives are the much smaller seriemas. P. longissimus is thought to have lived in woodlands and grasslands. Phorusrhacos grew up to 2.5 metres (8.2 ft) tall and weighed approximately 130 kilograms (290 lb). They had enormous skulls up to sixty centimeters long, armed with powerful, hook-tipped beaks. 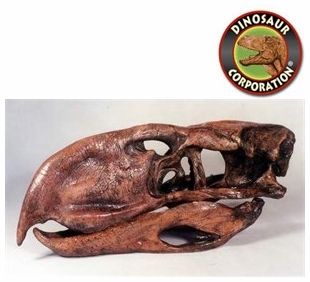 The structure of the beak and the large claws on the toes show that they were carnivorous.